Olinguito at Tandayapa Bird Lodge, Ecuador. May 22, 2014 - An appealing carnivorous mammal, a 12-meter-tall tree that has been hiding in plain sight and a sea anemone that lives under an Antarctic glacier are among the species identified by the SUNY College of Environmental Science and Forestry's (ESF) International Institute for Species Exploration (IISE) as the top 10 species discovered last year. Olinguito: A New Carnivore, Hidden in Trees Bassaricyon neblina Location: Ecuador The appealing olinguito, resembling a cross between a slinky cat and a wide-eyed teddy bear, lives secretively in cloud forests of the Andes mountains in Colombia and Ecuador. It is an arboreal carnivore that belongs to the family Procyonidae, which includes the familiar raccoon. The olinguito is smaller, though, typically topping out at about two kilograms (approximately 4.5 pounds). It is the first new carnivorous mammal described in the Western Hemisphere in 35 years. Its apparent dependence on cloud forest habitat means deforestation is a threat. Kaweesak's Dragon Tree: Mother of Dragons Dracaena kaweesakii Location: Thailand Sounding like something out of Game of Thrones and standing 12 meters (nearly 40 feet) tall, it's hard to believe the dragon tree went unnoticed this long. Beautiful, soft, sword-shaped leaves with white edges and cream-colored flowers with bright orange filaments are the hallmarks of this impressive plant. The dragon tree is found in the limestone mountains of the Loei and Lop Buri Provinces in Thailand and may also be found in nearby Burma. Valued as a horticultural plant, its small number (perhaps 2,500), and the fact that it grows on limestone that is extracted for the manufacture of concrete, has earned this species a preliminary conservation status of endangered. ANDRILL Anemone: Discovery on Ice Edwardsiella andrillae Location: Antarctica A species of sea anemone, living under a glacier on the Ross Ice Shelf in Antarctica, raises questions by its very existence. It is not clear how the species withstands the harsh conditions in its habitat. It is the first species of sea anemone reported to live in ice. It was discovered when the Antarctic Geological Drilling Program (ANDRILL) sent a remotely operated submersible vehicle into holes that had been drilled into the ice. This revealed the presence of small creatures, less than 2.5 centimeters long (one inch) with most of their pale yellow bodies burrowed into the ice shelf and their roughly two dozen tentacles dangling into the frigid water below. Skeleton Shrimp: A See-through Crustacean Liropus minusculus Location: California, U.S.A. This tiny shrimp, the smallest in the genus, was identified from among specimens originally collected from a cave on that island of romance, sunny Santa Catalina, off the coast of Southern California. Part of a marine family known as skeleton shrimp, only distantly related to the ones some humans love to dip in cocktail sauce, this crustacean is the first of its genus to be reported in the northeastern Pacific. The new species has an eerie, translucent appearance that makes it resemble a bony structure. The male's body measures just 3.3 millimeters (about an eighth of an inch); the female is even smaller at 2.1 (less than a tenth of an inch). 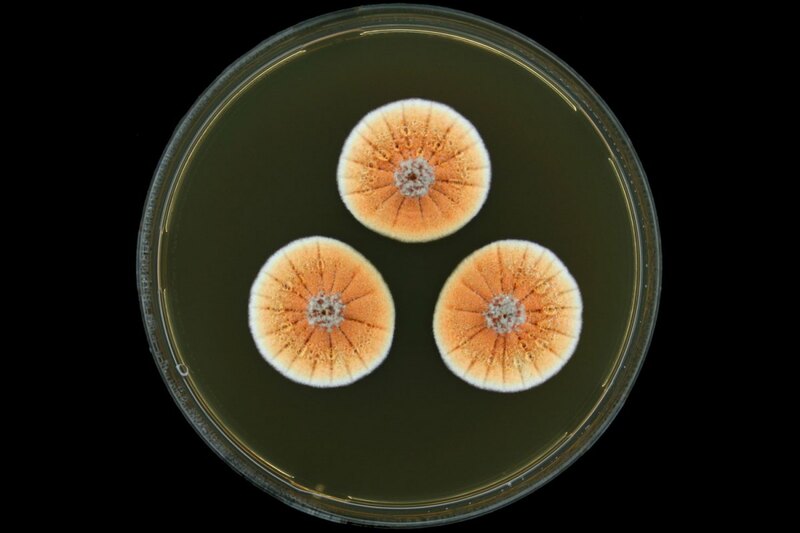 Orange Penicillium: A New Fungus among Us Penicillium vanoranjei Location: Tunisia Distinguished by the bright orange color it displays when produced in colonies, this fungus was named as a tribute to the Dutch royal family, specifically His Royal Highness the Prince of Orange. It was reported in a journal published by the National Herbarium of the Netherlands. The newcomer was isolated from soil in Tunisia. This species also produces a sheet-like extra-cellular matrix that may function as protection from drought. Leaf-tailed Gecko: Look Hard to See This One Saltuarius eximius Location: Australia It's not easy to spot this gecko, which has an extremely wide tail that is employed as part of its camouflage. With longer limbs, a more slender body and larger eyes than other Saltuarius species, this one has a mottled coloration that allows it to blend in with its surroundings. Native to rain forests and rocky habitats, this gecko is a bit of a night owl. It is found on the vertical surfaces of rocks and trees as it waits for prey. Surveys of similar habitat near the area where this species was found did not reveal additional populations, so this may be a rare species. The gecko was discovered on rocky terrain in isolated rain forests of the Melville Range of eastern Australia. Amoeboid Protist: Body Builder from the Mediterranean Spiculosiphon oceana Location: Mediterranean Sea This one-celled organism is four to five centimeters high (1.5 to two inches), making it a giant in the world of single-celled creatures. This foram (part of a distinct group among the many amoeboids) from the Mediterranean Sea gathers pieces of silica spicules, which are actually sponge fragments, from its surroundings and uses them like so many Lego blocks to construct a shell. It ends up looking much like a carnivorous sponge as well as feeding like one, extending pseudopods (a protist's version of arms) outside the shell to feed on invertebrates that have become trapped in the spiny structures. This species was discovered in underwater caves 30 miles off the southeast coast of Spain. Interestingly, they are the same caves where carnivorous sponges were first discovered. Clean Room Microbes: Alien Invaders? Tersicoccus phoenicis Location: Florida, U.S.A., and French Guiana There are some things we don't want to send into space and the newly discovered clean room microbes are among them. Found in rooms where spacecraft are assembled, this microbial species could potentially contaminate other planets that the spacecraft visit. Tersicoccus phoenicis was independently collected from the floors of two separate clean rooms around 2,500 miles apart, one in Florida and one in French Guiana. While frequent sterilization reduces the microbes found in clean rooms, some resistant species persist that can tolerate extreme dryness; wide ranges of pH, temperature and salt concentration; and exposure to UV light or hydrogen peroxide. Tinkerbell Fairyfly: Do You Believe in Fairies? Tinkerbella nana Location: Costa Rica The tiny size and delicately fringed wings of the parasitoid wasp family Mymaridae led to their common name: fairyflies. Tinkerbella nana, named for Peter Pan's fairy sidekick, measures just 250 micrometers (0.00984 inches) and is among the smallest insects. It is the latest addition to the 1,400 or so known species of the family. The new species was collected by sweeping vegetation in secondary growth forest at LaSelva Biological Station in Costa Rica. Although its host is not yet known, like other fairyflies it presumably has a life span of not more than a few days and attacks the eggs of other insects. Domed Land Snail: Looks Ghostly, Moves Slowly Zospeum tholussum Location: Croatia Living in complete darkness some 900-plus meters (nearly 3,000 feet) below the surface in the Lukina Jama-Trojama caves of western Croatia is zospeum tholossum. This land snail lacks eyes as they're not necessary in the total darkness of the caves, and it has no shell pigmentation giving it a ghost-like appearance. Only one living specimen was collected in a large cavern among rocks and sand with a small stream of running water nearby, however many shells were also found in the area. Even by snail standards, Zospeum tholossum moves slowly, creeping only a few millimeters or centimeters a week. Researchers suspect these small snails, measuring only 2 millimeters in length (0.08 inch), travel in water currents or hitchhike on other cave animals, such as bats or crickets, to travel longer distances. • Without a baseline of what exists, humans will not know if something disappears, moves in response to climate change or invades new habitats. "As long as we remain ignorant of the vast majority of species, we unnecessarily limit our effectiveness at conservation goals." • Billions of years of natural selection have driven plants and animals to solve the same survival problems that humans face. "By studying the millions of ways in which organisms have met challenges, we open a great library of possibilities for meeting our own needs more sustainably." • Simple curiosity is a factor. "If we want to understand what it means to be human the answer is buried deep in evolutionary history. We are a modified version of our ancestors, and they of theirs … all the way back to the first species on Earth. With the loss of every species, we lose one chapter in our own story that we'll never get back."